One of the New Year traditions that are unique to the Philippines is children being made to jump up and down at the stroke of midnight on New Year's Eve - as high as they can - in the belief that doing so would make the kids become taller. Romulo (2013) adds: "The higher you jump, the taller you'll grow. Even the smallest children are pulled out of their bed so that they, too, can jump and grow taller." Obviously, the idea that children can grow tall(er) just by jumping up and down on New Year's Eve is a 'tall tale'. But where did that tradition come fom? When and how did it begin? Unfortunately, this is a question that would require archival research, looking at chronicles of New Year celebrations in the past. The most that I was able to ascertain was its existence in the 1940s, as my own grandmother recounted her doing it with her brother. She recalls that "we would be asked to jump up and down by the grownups, telling us that we should do it so we would grow and become taller." My other grandmother said she has no recollection of such a practice, but my uncles and aunts do. Regardless of the origins and history of this practice, we can learn a lot from its very existence. For instance, implicit in this tradition is the desire to grow tall, which in turn is premised on the premium that our society places on height, or tall stature. This premium is evidenced by many other things we can observe in everyday life, such as height requirements for various jobs, and the proliferation of growth supplements that glorify height (i.e. "Height is Might") and reify the importance of height in society through imagery that invokes basketball, the "tall man's game" that also happens to be the Philippines' national sport (Antolihao, 2010). Genetics, nutrition, quality of life, and the presence/absence of childhood diseases: these are the factors that have been shown to affect final, adult height. But just like health itself, these things have social determinants, making height itself a function of economics, both on the macro-scale and the micro-scale - though of course there are exceptions: not all rich people are tall, and not all poor people are short. Still, height, by representing these things, acquires a symbolic value that makes tall people "may dating" (with impact) - furthering the social value of both height and its bearer. This is a theme that I am pursuing in my research and I will have more to say about this in the coming months and years. Going back to the children jumping during the New Year, I wonder if it is height itself that grows taller in the tradition; that is, it the notion of height as an important attribute of the body that gets highlighted, reinforced, and reified by the process of its pursuit. On the other hand, the young people themselves, when I talk to them, do not seem convinced that the jumping will make themselves grow tall. Perhaps they do it because "wala namang mawawala" (there is nothing to lose). Indeed, for children whose heights and fortunes are not yet final, there is nothing to lose and much -- a few more inches -- to gain. Antolihao, L. (2010). Rooting for the Underdog Spectatorship and Subalternity in Philippine Basketball. Philippine Studies, 449-480. Romulo, L. (2013). Filipino Celebrations: A Treasury of Feasts and Festivals. 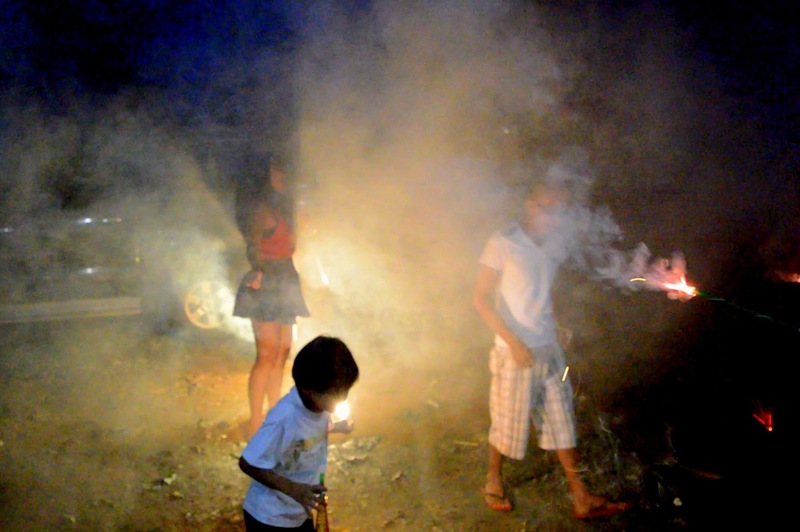 This is a Chinese tradition in welcoming the New Year which the Filipinos have adopted. The Chinese, however, need to have only eight round fruits on the table because the number 8 signifies good luck. For Filipinos the belief is that the 12 round fruits represent 12 months of the year and assure good fortune to the family members all year round. He adds that assembling this ensemble of fruits isn't difficult: "As a tropical country, it is not difficult in the Philippines to find round-shaped fruits such as oranges, watermelons, mangoes, pineapples, guavas, rhambutans (sic), jackfruits, pomelos and peaches." Anthropologists have seen fruits as an important part of food culture. In the Philippines, as in other parts of the world (cf. Manderson, 1987), fruits belonged to the 'cold' classification under a hot/cold categorisation, which implicates foods in illness causation and treatment. Tan (2008:85) writes: "Fruits are considered "cold" and therefore avoided in the morning, the coldest part of the day, with the belief this intensification of the cold condition could result in ailments like diarrhoea and an aggravation of respiratory problems such as pneumonia. Doubtless, this belief contributes to the making of the typical Filipino breakfast, which characteristically does not include fruits, but as looks very much like the rice-based lunch and dinner (Fernandez, 1994). There are also certain fruits that have particular beliefs. Eating guavas, for instance, was believed to cause appendicitis - a belief that has parallels in many countries, including the United States where tomato seeds and grape seeds are implicated instead of guavas. Likely impelled by this popular belief, a study by Engin and others (2011) concluded that "most of the people eat fruit seeds and plant residuals do not develop appendicitis generally", but this belief continues to be widely held by the popular sector. Of another fruit, santol, Alano (2008) writes in her column in Philippine Star: "We were mortally afraid of swallowing santol seeds because we were told that if we did, a santol tree would grow inside our stomach. With all the seeds we had swallowed, we would have grown an orchard!" There is much more about fruits to discuss in terms of various beliefs ascribed to particular ones, but I would like to dwell on what I consider as a more pressing concern: that of the marginalization of native fruits in the Philippines. What are these native fruits? First let me disclaim that the word "native" is not a botanical claim of endemicity, as surely, many of these fruits have actually come from elsewhere, given the Philippines' long history. Rather, I use the term 'native' to mean fruits that can actually grow in the country, and does not have to be imported from elsewhere. These fruits are too many to mention: the atis (sugar-apple; Annona squamosa), guyabano (soursop), langka (jackfruit), chico (sapodilla; Manilkara zapota), macula (Syzygium samarangense), duhat (Syzygium cumini), siniguelas (Spanish plum), and many more. The abundance of these fruits owes to the wealth of biodiversity in the country but also the heritage of international exchange, with some of these fruits coming from the Americas, as introduced by the Spanish colonial settlers. When I was a schoolchild, I would see mangoes and santol sold as snacks in front of the school, accompanied by rock salt or bagoong (fish paste) as condiments. Bananas and jackfruits figure in snacks like turon, which were sold in the school canteen. Just a block away from our school, there were trees that had wild berries. We didn't have any name for them so we called them 'raspberries' because that was the closest thing we can identify them with. Fruits, by themselves and as ingredients, had many roles. Today, however, these fruits have dwindled in importance. Though the fruity snacks can still be found, especially in rural areas, in many places, they have given way to junk foods, candies, among others. Moreover, it has become increasingly more difficult to find native fruits. Temperate fruits such as apples, oranges, grapes, are most prominent in supermarkets nowadays. Statements like "An apple a day keeps the doctor away" came with the Americanization of education, arguably further strengthening the place of these fruits in our imagination. At a time when apples and oranges were hard to get, they likewise functioned as "prestige foods" (Tan, 2008) - a perception that has persisted today even as their global scale of production and the instruments of globalisation have allowed these fruits to be distributed and sold in the Philippines at very affordable prices. On the other hand, native fruits have been marginalized. With little demand for them, there was little impetus to conduct research on the fruits, and turn them into commercial varieties. Mangoes, perhaps owing to their sheer deliciousness, have not suffered this fate. However, ironically it is more expensive to buy local mangoes than imported apples or pears. On the other hand, the dalanghita or dalandan, a citrus fruit which probably has virtually the same nutritional content as the orange, can be had for 20-30 pesos ($0.45-$0.70) per kilo even in Metro Manila - the same price as a single piece of orange. Yet, it is under-utilised, perhaps seen as a "poor man's orange". Whenever I could, I would drink a whole glass of pure, freshly-squeezed dalandan juice in the morning for a half the price of a bottled, artificially-sweetened juice drink! From both a nutritional and an economic perspective, this disparity is unfortunate. For example, in Palawan, I discovered three kinds of fruits that I never even knew existed: the tabo, the aritum, and another fruit whose name escapes me at the moment (see the cover photo for this article). Harvested from the forests and with flavours rivalling that of the mangosteen, these fruits deserve a wider audience, not least of which because of their nutritional potential. Farmers would have an additional source of income if the fruits that just grow in land would grow in economic significance. Much has been said about our agricultural industry languishing, but there is little hope indeed if even the consumers would rather patronize the produce of other countries. We have to celebrate our fruits, not just seeing these fruits as part of New Year's Eve, but as a healthy part of our everyday diet. Scientific studies by our local scholars can advance this cause by demonstrating that the nutritional value of these fruits, not just an apple, can keep the doctor away. Perhaps it is not just the injunction against "cold" fruits in the morning that have discouraged people from buying fruits as part of their everyday diet, but the cost of it. But if only native fruits were to be made more available and affordable, then the population will given a health boost. This is not entirely a lost cause. Spurred by a growing health consciousness or healthism (Crawford, 1980), the middle and upper classes are buying more varieties of native fruits, and this is evidenced by their proliferation in high-end supermarkets in Metro Manila. Coconut juice has entered the mainstream market as an everyday beverage, certainly a much better choice over those artificial "fruit juice drinks" - and a very sensible drink in a country that has a lot of coconuts. In Indonesia and Malaysia, however, I see jus jambu (guava juice), jus belimbing (starfruit juice), among others, in mall stores - a sign that these fruits are not quite as marginalised as they are in the Philippines. We have to take pride in our native fruits if we are to benefit from the nutritional and economic benefits they can give us. This involves, among others, the government prioritising research on these fruits, and looking at ways on how the educational system might have innocuously promoted foreign fruits as 'prestige foods', using them as examples in illustrations and drawings while failing to highlight our own botanical heritage. With these thoughts, I wish you a fruitful new year! Engin, O., Yildirim, M., Yakan, S., & Coskun, G. A. (2011). Can fruit seeds and undigested plant residuals cause acute appendicitis. Asian Pacific journal of tropical biomedicine, 1(2), 99-101. Fernandez, D. (1994). Tikim: essays on Philippine food and culture. Manila: Anvil Publications. Manderson, L. (1987). Hot-cold food and medical theories: overview and introduction. Social Science & Medicine, 25(4), 329-330. Tan, M. L. (2008). Revisiting usog, pasma, kulam. Quezon City: UP Press.